Yamaha MusicCast System hands-on hands on review | What Hi-Fi? It seems Yamaha does things when it’s good and ready. No rushing, no bowing to commercial pressure. It may be very late to the multi-room systems market, but it is armed with what it hopes is a game-changer: MusicCast. 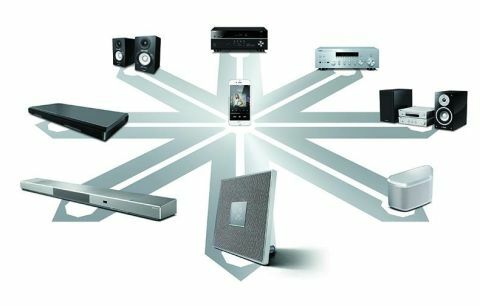 The point of MusicCast is to create a network that comprises AV receivers, micro systems, stereo amps and soundbars - because you’re more likely to have a mix of different AV kit, and not everybody has or wants to add wireless speakers in every room (although MusicCast caters for them too). How does it work? You need a MusicCast-compatible product, of which 23 have just been announced. Take one and press a dedicated connection button. This is then detected by the MusicCast app, which is free on iOS and Android. The two then communicate over your home’s Internet network. Every additional product, whether by ethernet or wi-fi, is connected this way – not unlike pairing something via Bluetooth. Now you'll see a list of connected products in the MusicCast app, which is lovely and intuitive. You can organise all of your MusicCast products into rooms (e.g. bedroom, kitchen, secret bunker). The personalisation goes so far as to let you add your own photos to the app, too (we'd have food pics for the dining room, Batman symbol for the garage). Naturally, you can choose where you play music. Same song everywhere? Different song per room? No problem. And you can also adjust volume levels for all. So far, so multi-room. Every connected product can be tweaked sonically with tone controls and equalisers (depending on the products themselves). In one way, out another... and another. But here’s where it gets fun. Every MusicCast product is capable of sending and receiving Bluetooth. That means you can include non-MusicCast products, too: use that third-party speaker in your garden, or hook up a pair of wireless headphones. There are analogue connections too, and everything plugged into one MusicCast product can then be played on all the other connected products. Our demo featured a tablet plugged into a Yamaha Restio ISX-80 desktop speaker. We were able to make the sound jump over to a Yamaha WX030 wireless speaker, and then over to a pair of Bluetooth headphones. Although it was a prototype system, the experience proved seamless and incredibly easy to use. In fact, Yamaha tells us a ten-year-old was brought in to test the usability, which sounds believable. In theory, you can plug a CD player into your AV receiver in the living room, and stream that over to the micro system in the bedroom. Or plug in a USB stick and play that on the little wireless speaker in the garage. It seems a MusicCast AV receiver might give you the most bang-per-buck as it has the most connections in the range. In terms of music services supported by Yamaha MusicCast, there's Spotify (via Connect), Apple Music (AirPlay), internet radio, Napster and Pandora. More will follow: there were mentions of Tidal, Deezer and Qobuz too. Reassuringly, Yamaha doesn’t see multi-room music as a fad. The company says that MusicCast is a crucial part of the company’s plans for the next 5-10 years, and that in the future all Yamaha products will be part of the MusicCast system. Based on what we’ve glimpsed, we can’t wait to see more. We’ll be getting the MusicCast products in for full reviews very soon.